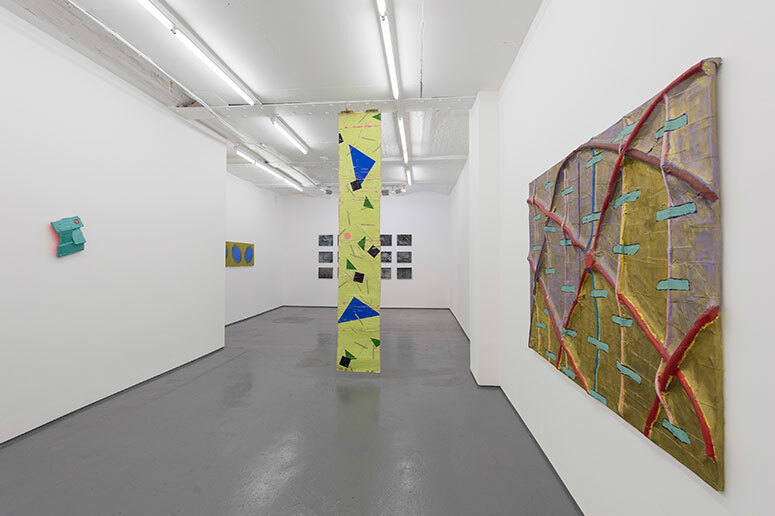 The current exhibition at FOLD Gallery creates a strange and dynamic world of associations between organic and geometric abstraction. Powerfully inhabiting the static white basement gallery, the show is inspired by the events and atmosphere in ‘Flatland’, a Victorian novel written in 1884 by English schoolmaster Edwin Abbott Abbott. This story tells us about the journey of Square, a mathematician, who is a resident of the two-dimensional Flatland. In this environment women are thin straight lines, the lowliest of shapes, while men may have any number of sides, depending on their social status. Tim Ellis allows the narrative to anchor his approach to the curation of the show, but it feels important that there is an intuitive terrain created by the interaction, the equilibrium, and the overall intensity of the hang. Richard Kirwan has an ongoing interest in the orchestration of insistent pattern. The field of white symbols within all these works (the star of life) makes a connection between the three paintings. In each segment of each painting the tonal variation is a conscious choice. The Depth of Field, a painting shown in 2011 in The Indiscipline of Painting, first at St. Ives and then at Warwick University, is key to understanding Kirwan’s control of the space and the framing of that space. This reference, and a Jeff Koons sense of banality, are essential ingredients in this optically-layered approach. But perhaps more importantly, Kirwan references a specific neighbourhood: Coenties Slip, where in 1955 artists including Ellsworth Kelly and Agnes Martin made work in studios that were deserted sail-making lofts. The clarity of these works is startling as they begin to enter your subconscious mind, leaving retinal images scattered within your neurological pathways. Placed directly opposite Kirwan’s work is a set of fifteen paintings by John Wilkins: Jack, 2003. These works are layered entities. The surface is glossy and varnished, that final layer of facture creating objects that are resilient, not just in terms of their physical structure, but also through the reading of the series as a kind of situated event. This event seems to be taking place over an unstated time period, perhaps deep underground, or maybe operating in a more bodily context. The pictorial depth is still fairly frontal, accentuating a process of overlaying one complete painting over another in a fluid manner. The drawing looks free-hand, or sometimes aided by stencils, but what is overwhelming about these pictures is their ability to take the viewer into their flow. The proximity of each work in the hang is vital in terms of weight of matter and distance in space. For Wilkins, repeated practice is both the form and subject of his canvases, which he describes as “paintings of paintings; paintings of painting, and always paintings of the of.” But I felt that these works got inside my head through a process of metamorphoses – from dissonance to resonance. Pool (2015) by Stephen Buckley has a superb physical identity. It is an interwoven and interlocking work, combining a sense of the wounded and the radiant. The feeling of a West Hollywood location, conjured up by the title and the look of the work, gives the painting considerable stature. Certain angles evoke a similar tension to that seen in the work of Max Ernst’s reliefs such as Red Forest (1970), and in Buckley’s recent relief Regatta (2014), the tension in the work comes from the overlay of structures. As Tim Ellis mentioned in a recent talk at FOLD Gallery, “Buckley makes things that ought not to work but for whatever reason, they do work, because of that awkwardness that he is not afraid of testing”. What is startling in this instance is the red glow behind the work, which has an intense effect against the weight and density of the paint-bandaged rectangles. The small orange circle has a manufactured feel, and this adds a cultural and natural rhythm. Etagnac (1990) picks up on both Duchamp and Picabia in terms of the strangeness of its whole surface; the complex assemblage of this work confronts us with a primordial intensity. Simon Allison’s work brings the darkest set of connotations in the show. The physical dislocation, the roughly cut edges, and the scrawled gestures give the work added force, and combine to enable a feeling of machine made memory. The works calls to mind dirty old London of 1884 – stealing lead off the church roof? The relationships between the works in his Fall series are developed by a highly industrial process. The poured lead finds its way into the space created by what’s left of – perhaps – a child’s railway set. The balance of system versus the intuitive construction of these works is the intriguing element. Instrumental to the work of Jane Harris is the integrity of the brushwork and the act of the hand in play, visible in the works’ construction. The perfect structural tectonics pull the focus very close to the surface facture. The oil paint is used with a clarity that allows this microscopic inspection. Zooming in and out of the picture space, the eye is dazzled by the interlocking colour relationships, and how the light plays on the surface patterning. Restless Sublime (2016) has the feeling of a James Turrell sky space in its composition . The atmosphere has a spatio–temporal quality that expands our interpretation of the universe. These works activate a multiplicity of meanings, and connect us back to the compulsion of nature with its vastness and suddenness. In terms of Flatland, the title of the other triptych is fundamental (outlandish) as it allows the feminine to become articulated as darkness and the abyss. Tim Ellis’s works contains active force and a positive sense of desire. His elongated paintings are made on cotton pillow cases, sanded down between layers of acrylic and then varnished very heavily. They work slowly on the senses, and are macroscopic, allowing you to see the puckered cracks and fissures. El Lissitsky’s New Man, painted in 1923, contemplates the possibility of thinking about space differently, through geometric division amenable to transformation. These banner-like paintings immediately find those connections within all of the other work in the show, functioning like satellites, sending out signals, oscillating within Flatland, opening up the possibility of phenomenology into technology.